After the success of Grimsli, the Towering Evil Clown in 2017 we will be seeing more larger than life clowns in our future. Later this year we will get Sweet Dreams, another very tall clown who is sure to leave an impression that will guarantee your dreams will be anything but sweet. He’s available now at Halloween Express for $279.95. Sweet Dreams is made by Seasonal Visions and is a lot like the Towering Evil Clown that did so well last year. Both props stand just under seven feet tall. You can’t blame Seasonal Visions for going to the well again this year for another tall, creepy clown. After “It” came out last year and dominated at the box office everyone had to have Grimsli at their Halloween party. Unfortunately the brass at Spirit Halloween didn’t anticipate the popularity of the prop and they were sold out by mid-September. This year Sweet Dreams should be one of the most popular new props of 2018. 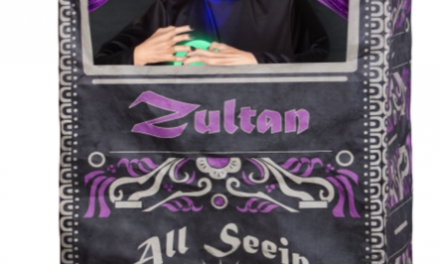 As you can see the Sweet Dreams animatronic has a child in his grasp. The poor kid never had a chance. I like the twist of adding a screaming child with the Towering Clown. I also like the new color scheme. Last year’s variation featured red and white clothing and red hair. Grimsli also had red eyes. Sweet Dreams has a black and white clown suit and has some creepy black hair. Unlike Grimsli, Sweet Dreams has black hair and has some smudged black lip stick which looks really creepy. His eyes also glow green when activated. It’s not known what the price point will be for the new clown animatronic. Last year the Towering Clown sold for $199.99 at Spirit Halloween. Halloween Express sold a Towering Boogeyman for $279.79. The Boogeyman was a similar prop that featured a reaper holding a screaming little girl. I’m not sure if Sweet Dreams will be at Halloween Express or Spirit Halloween but I imagine his price point will be around $249-$299. 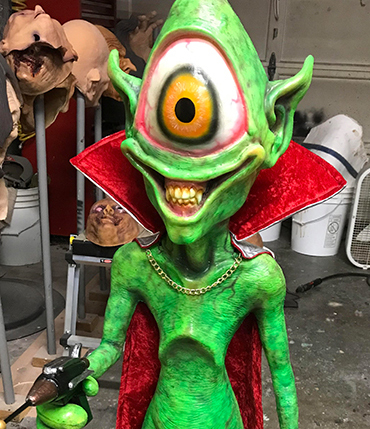 UPDATE: The folks at Morris Costumes were nice enough to send me some info on their newest props after Hauntcon. From what I’ve gathered Sweet Dreams will likely cost around $299.99 at retail. The cost could be slightly lower or higher but should remain in the $300 range. More information will likely be available later this Spring. It’s even possible that Sweet Dreams never makes it to retail. 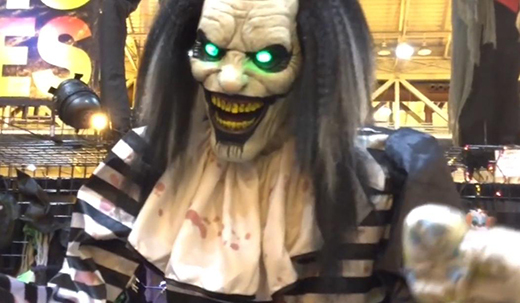 Sometimes manufacturers use trade shows like HauntCon to gauge interest in new props. If there isn’t much interest animated props can be shelved indefinitely. Last year we saw this happen to the Animated Arkham Asylum Joker prop. Batman’s nemesis was set to take over Halloween 2017 but Morbid Enterprises scrapped him after he received little interest. With that being said, I really don’t think Sweet Dreams will be nixed by Seasonal Visions. After their Towering Clown sold out in just a few weeks they would be crazy to not give Sweet Dreams a shot in 2018. Stand by for news as it becomes available. Typically new Halloween props are available for pre-order in the late Spring/early Summer and ship in late August or early September. Halloween 2018 can’t get here fast enough.